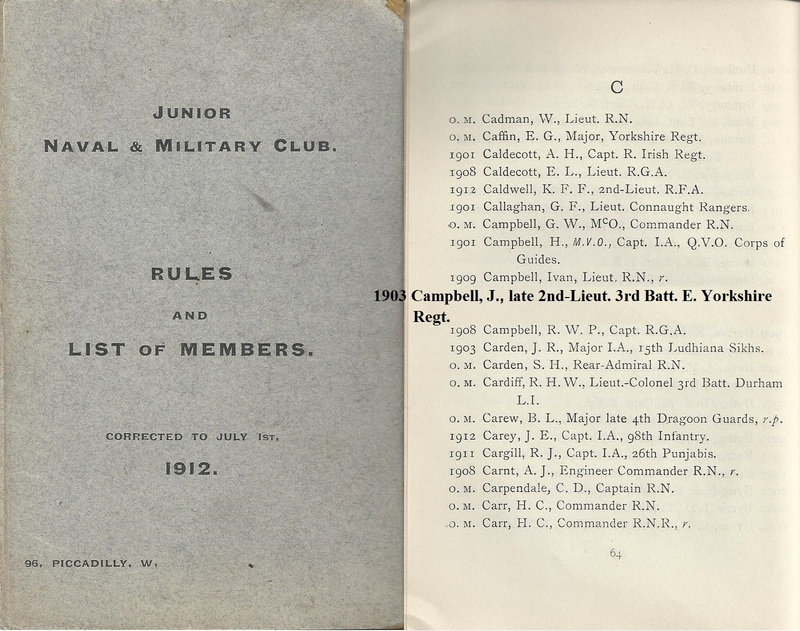 My book tells of one John Campbell who returned from Argentina to fight in WWI and who through his Army records I knew had been a member of the Junior Naval & Military Club in Piccadilly. My research for the book did not find any significant evidence or information about this club either at the National Archives or the British Library. In addition internet searches were silent on the subject..in fact Wikipedia has the original club listed but not its reopening c. 1900 at 96 Piccadilly. The resurrection of the club was probably a result of the senior Naval & Military Club being full and the military activity at the time, particularly the Boer War. Then a couple of weeks ago I discovered by chance the book below, listed on Amazon, but sold by a book dealer specialising in military history. I bought it. Inside is the entry for my John Campbell who had indeed been a member of the East Yorkshire regiment. Besides containing the rules of the club which includes “No ladies shall be introduced as Visitors to the Club except those who would be eligible to be received at Court…”, there is a list over over 3000 members as at July 1912. Possibly the basis for a new book!! This entry was posted in Uncategorized and tagged East Yorkshire Regiment, junior Naval & Military Club, Seeking John Campbell. Bookmark the permalink.